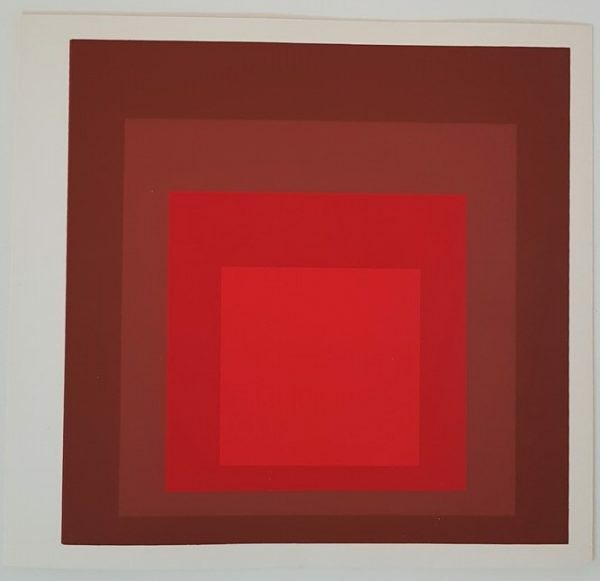 Josef Albers (March 19, 1888 – March 25, 1976) was a German-born American artist and educator whose work, both in Europe and in the United States, formed the basis of some of the most influential and far-reaching art education programs of the twentieth century. 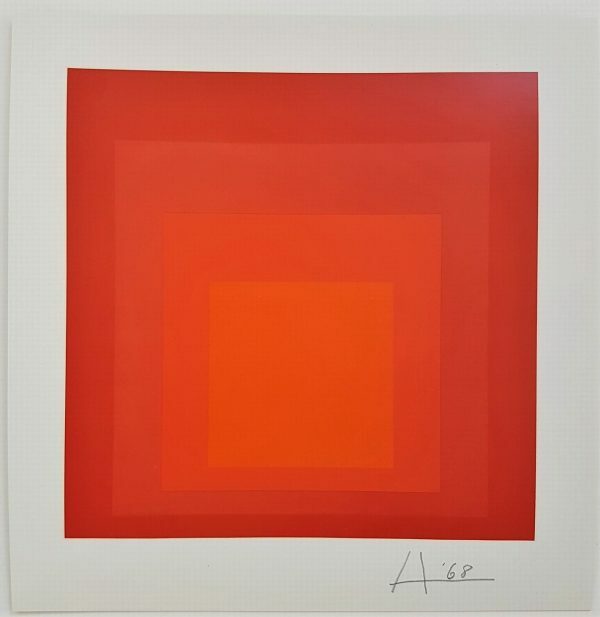 Albers was born into a Roman Catholic family of craftsmen in Bottrop, Westphalia, Germany. 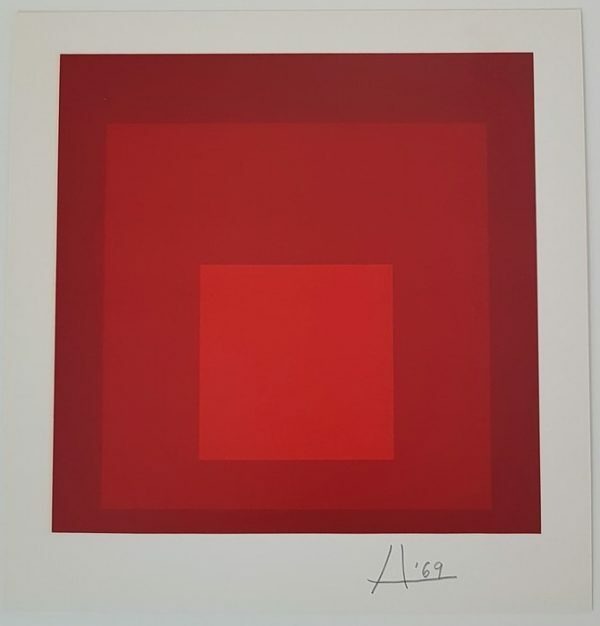 He worked from 1908 to 1913 as a schoolteacher in his home town; he also trained as an art teacher at Königliche Kunstschule in Berlin, Germany, from 1913 to 1915. 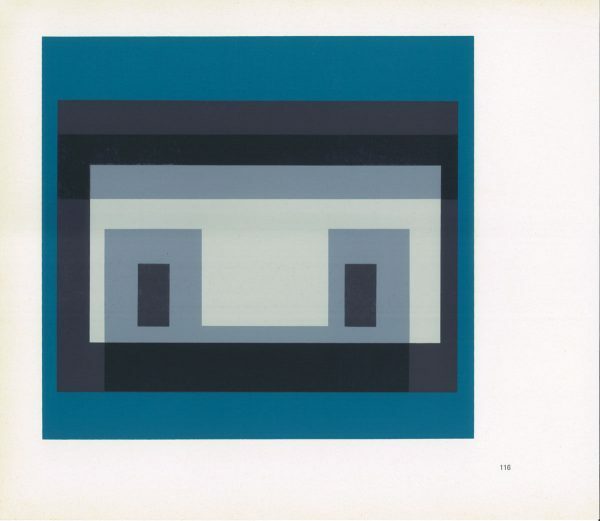 From 1916 to 1919 he began his work as a printmaker at the Kunstgewerbschule in Essen. In 1918 he received his first public commission, Rosa mystica ora pro nobis, a stained-glass window for a church in Essen. In 1919 he went to Munich, Germany, to study at the Königliche Bayerische Akademie der Bildenden Kunst, where he was a pupil of Max Doerner and Franz Stuck. 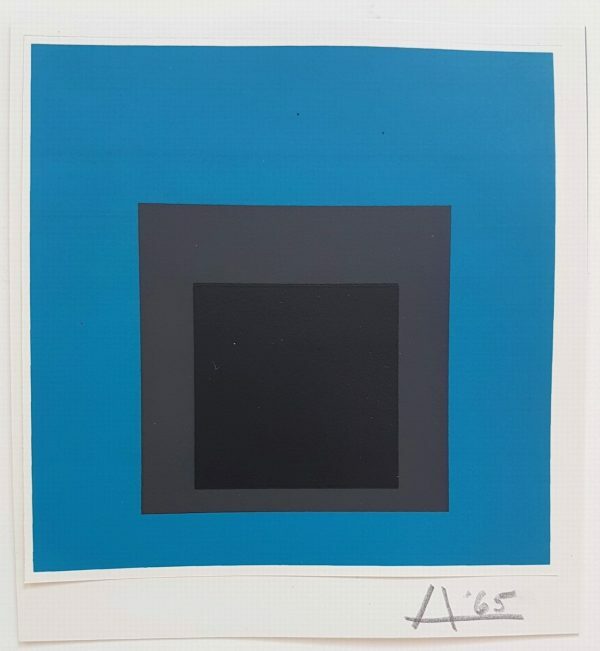 Albers enrolled as a student in the preliminary course (Vorkurs) of Johannes Itten at the Weimar Bauhaus in 1920. 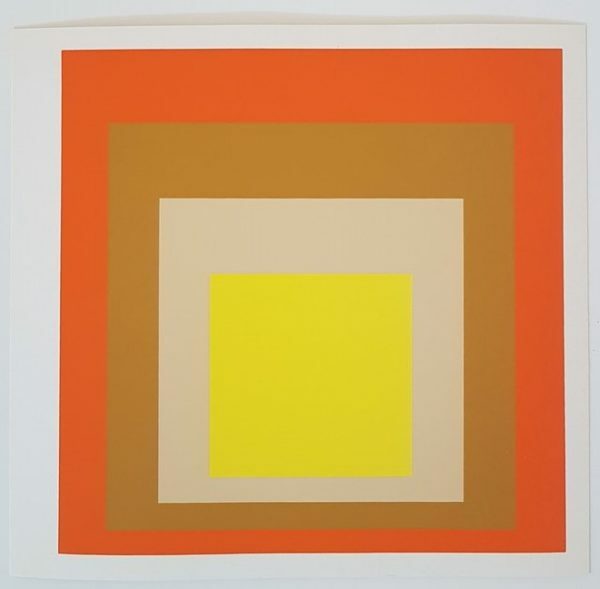 Although Albers had studied painting, it was as a maker of stained glass that he joined the faculty of the Bauhaus in 1922, approaching his chosen medium as a component of architecture and as a stand-alone art form. 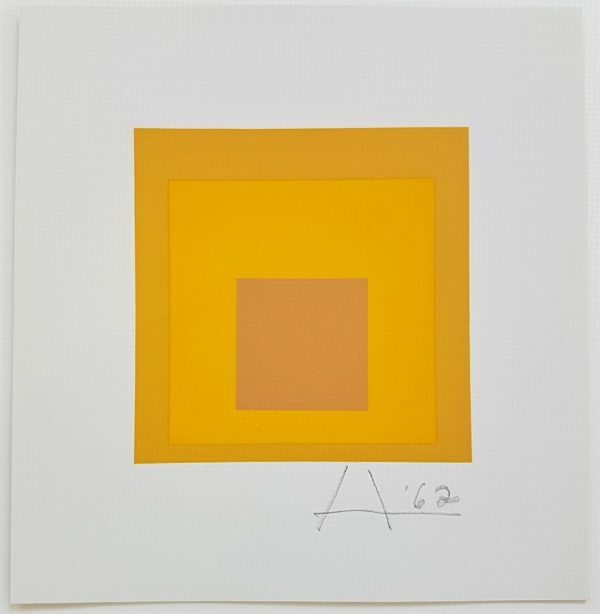 The director and founder of the Bauhaus, Walter Gropius, asked him in 1923 to teach in the preliminary course ‘Werklehre’ of the department of design to introduce newcomers to the principles of handicrafts, because Albers came from that background and had appropriate practice and knowledge. 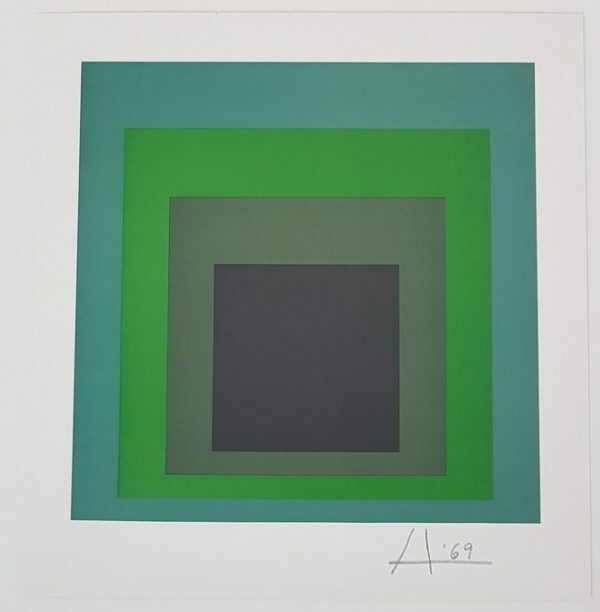 In 1925, Albers was promoted to professor, the year the Bauhaus moved to Dessau. 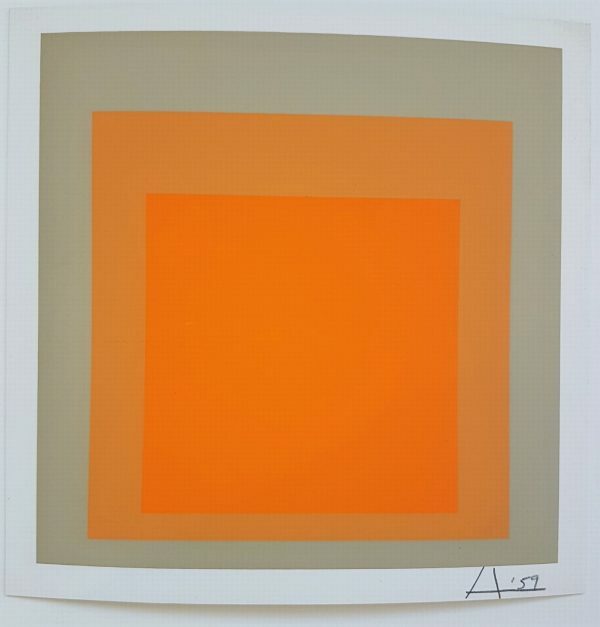 At this time, he married Anni Albers (née Fleischmann) who was a student there. 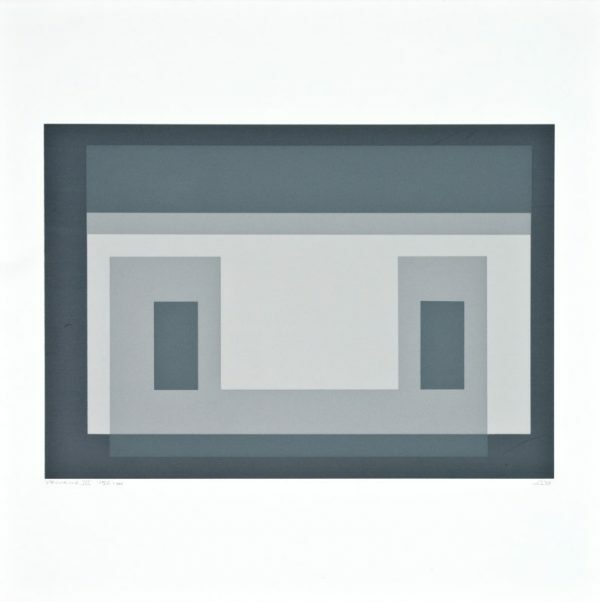 His work in Dessau included designing furniture and working with glass. 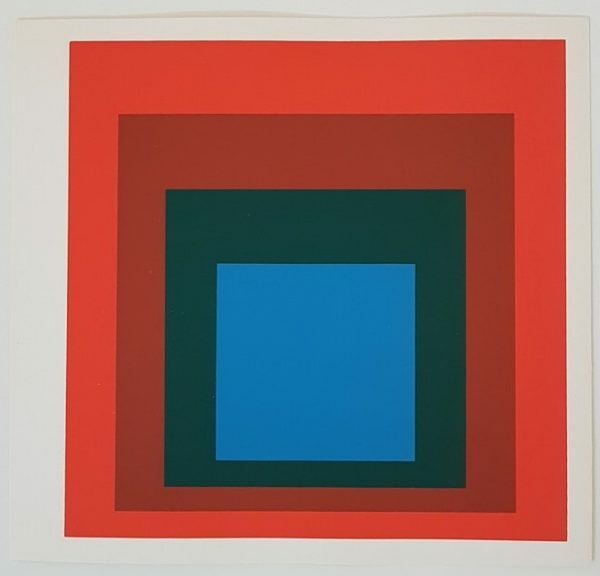 As a younger art teacher, he was teaching at the Bauhaus among artists who included Oskar Schlemmer, Wassily Kandinsky, and Paul Klee. 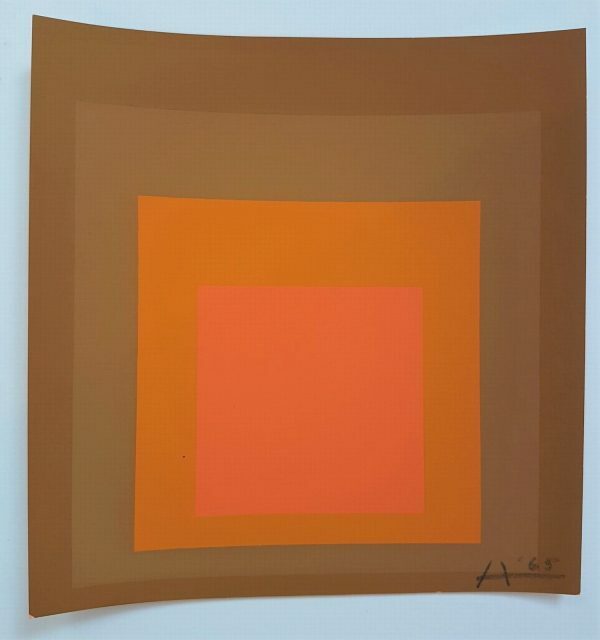 The so-called form master, Klee taught the formal aspects in the glass workshops where Albers was the crafts master; they cooperated for several years. 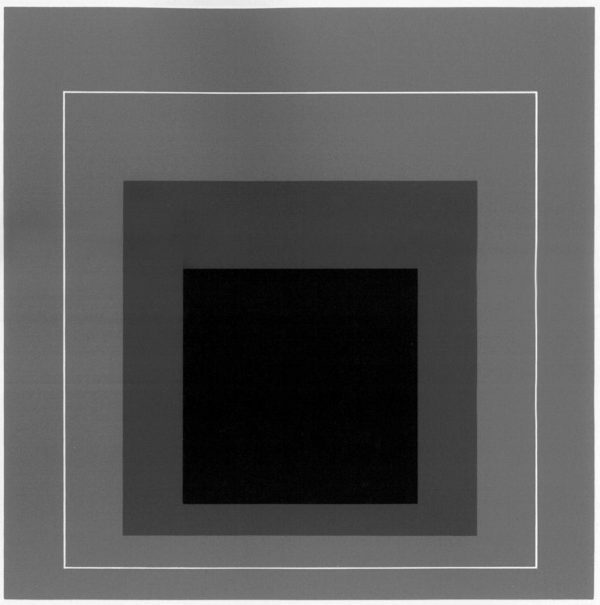 With the closure of the Bauhaus under Nazi pressure in 1933 the artists dispersed, most leaving the country. 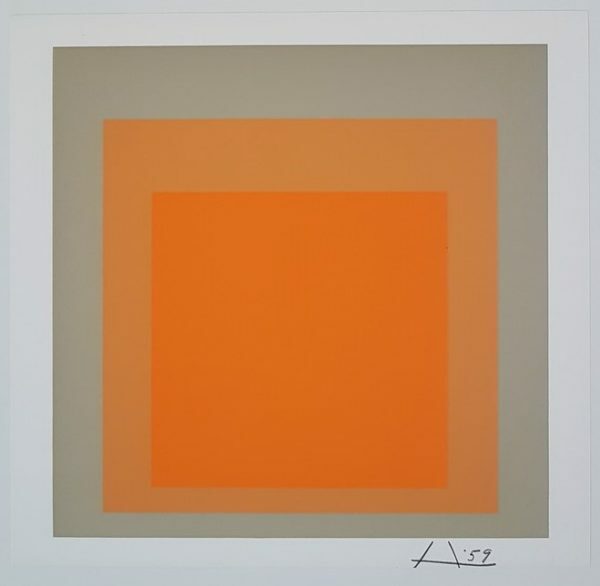 Albers emigrated to the United States. 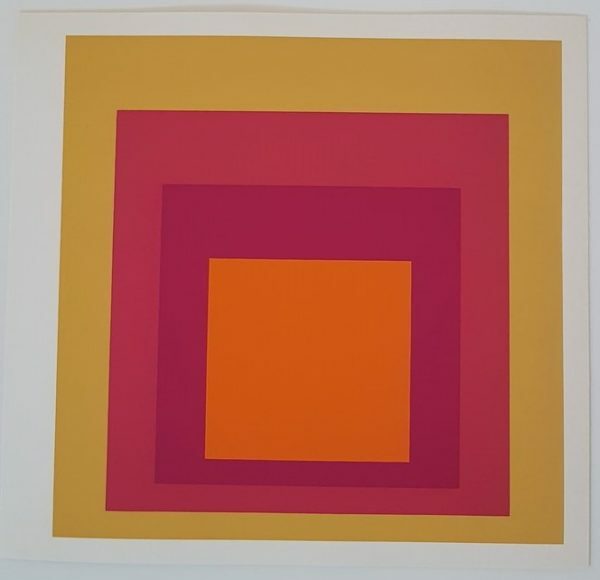 The architect Philip Johnson, then a curator at the Museum of Modern Art, arranged for Albers to be offered a job as head of a new art school, Black Mountain College, in North Carolina. In November 1933, he joined the faculty of the college where he was the head of the painting program until 1949. At Black Mountain, his students included Ruth Asawa, Ray Johnson, Robert Rauschenberg, Cy Twombly, and Susan Weil. He also invited important American artists such as Willem de Kooning, to teach in the summer seminar. 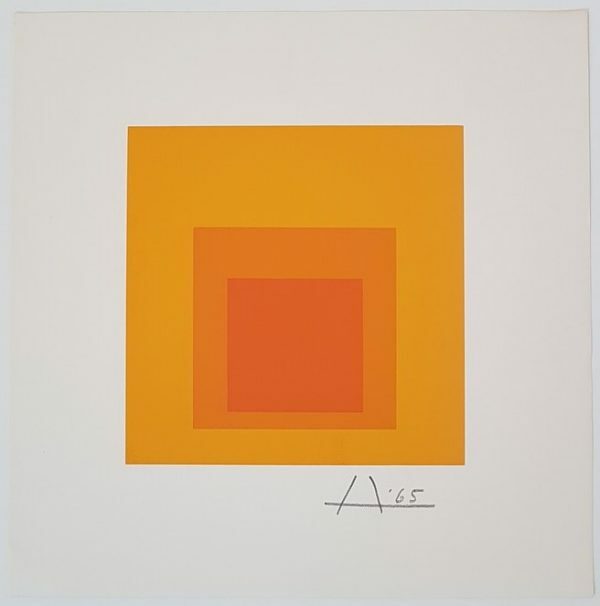 Weil remarked that, as a teacher, Josef Albers was “his own academy” and she said that Albers claimed that “when you’re in school, you’re not an artist, you’re a student”, although he was very supportive of self-expression when one became an artist and began her or his journey. 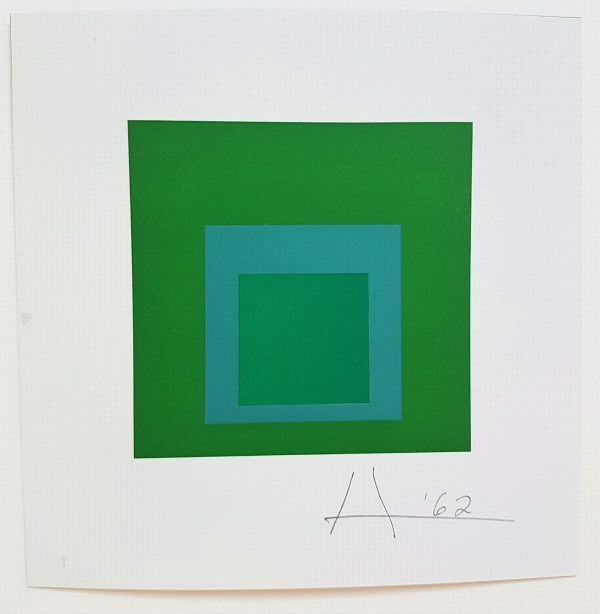 Albers produced many woodcuts and leaf studies at this time. 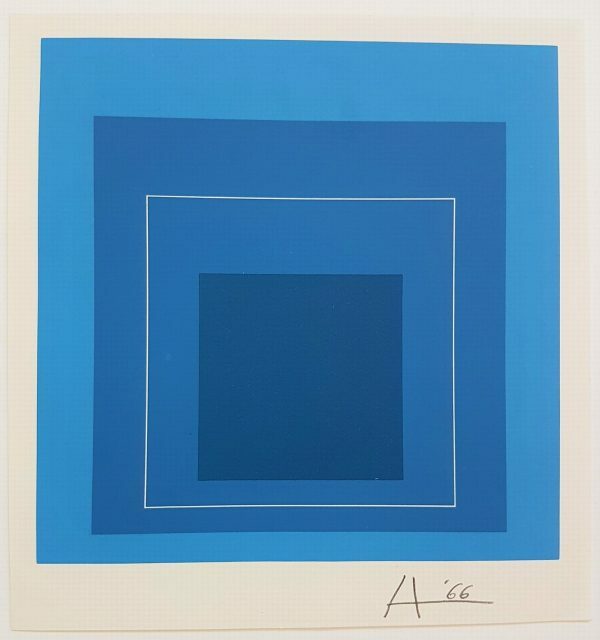 In 1950, Josef Albers left Black Mountain to head the department of design at Yale University in New Haven, Connecticut. 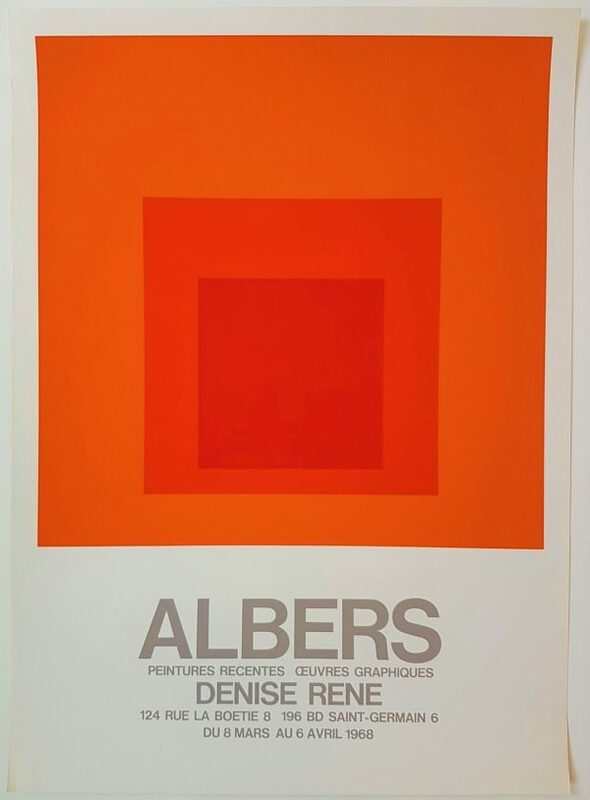 While at Yale, Albers worked to expand the nascent graphic design program (then called “graphic arts”), hiring designers Alvin Eisenman, Herbert Matter, and Alvin Lustig. 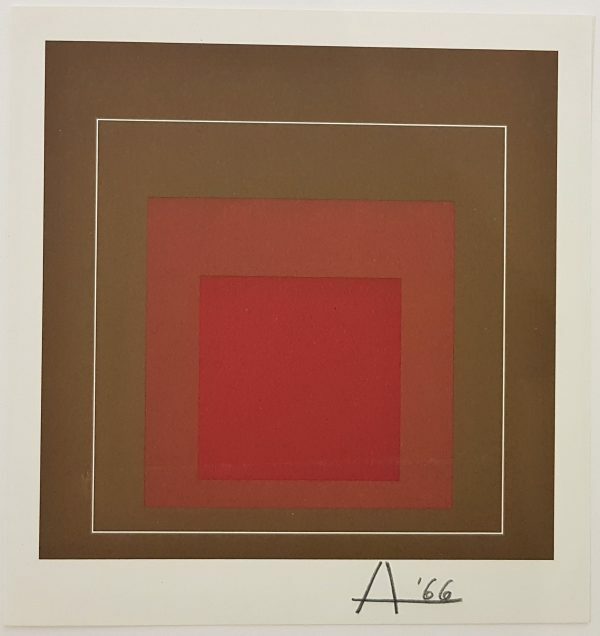 Josef Albers worked at Yale until he retired from teaching in 1958. 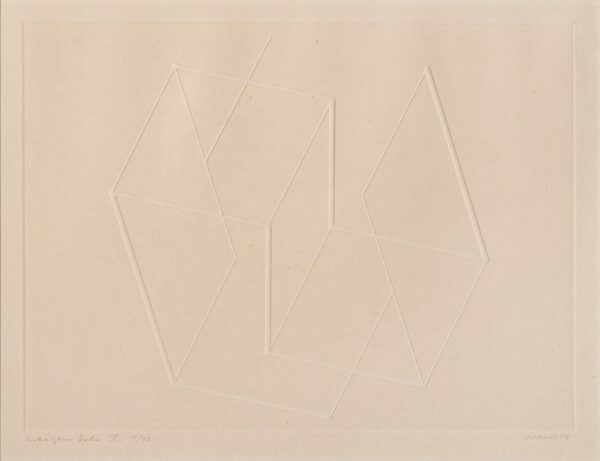 At Yale, Richard Anuszkiewicz, Eva Hesse, Neil Welliver, and Jane Davis Doggett were notable students. 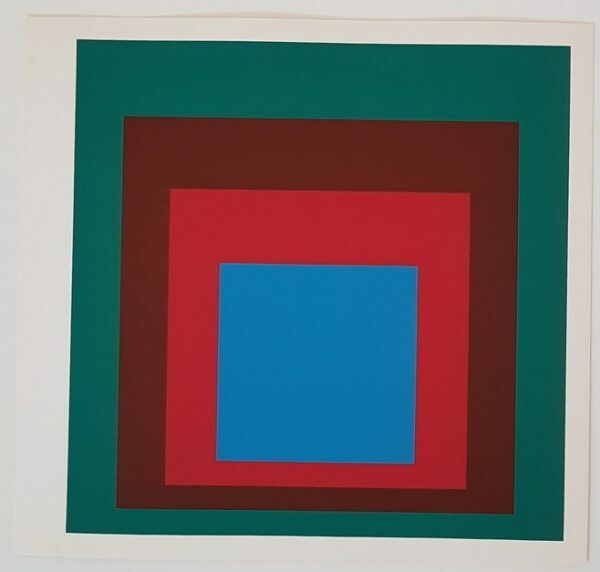 In 1962, as a fellow at Yale, he received a grant from the Graham Foundation for an exhibit and lecture on his work. 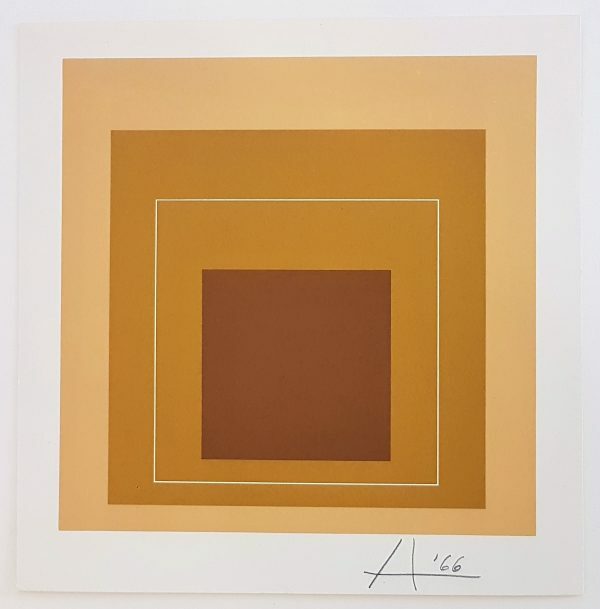 Josef Albers also collaborated with Yale professor and architect King-lui Wu in creating decorative designs for some of Wu’s projects. Among these were distinctive geometric fireplaces for the Rouse (1954) and DuPont (1959) houses, the façade of Manuscript Society, one of Yale’s secret senior groups (1962), and a design for the Mt. Bethel Baptist Church (1973). Also, at this time he worked on his structural constellation pieces. 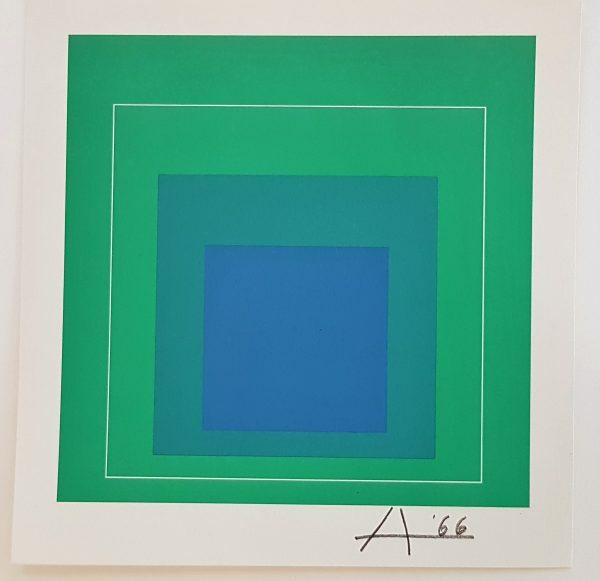 In 1963, he published Interaction of Color which presented his theory that colors were governed by an internal and deceptive logic. 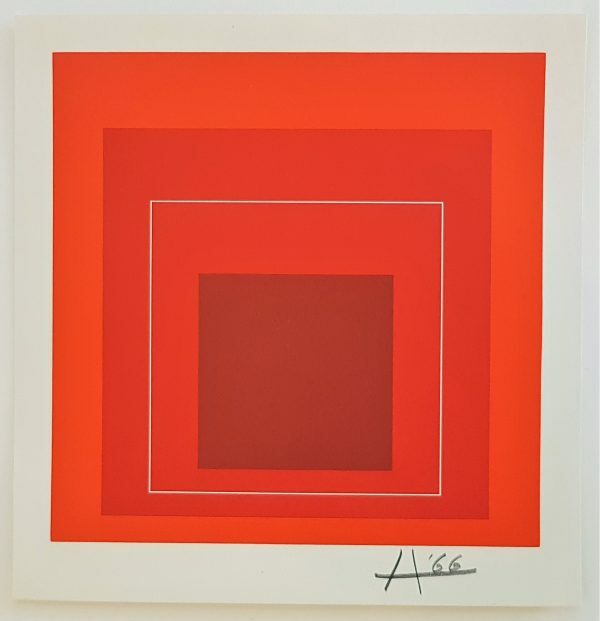 The very rare first edition has a limited printing of only 2,000 copies and contained 150 silk screen plates. This work has been republished since and is now even available as a cell phone app. 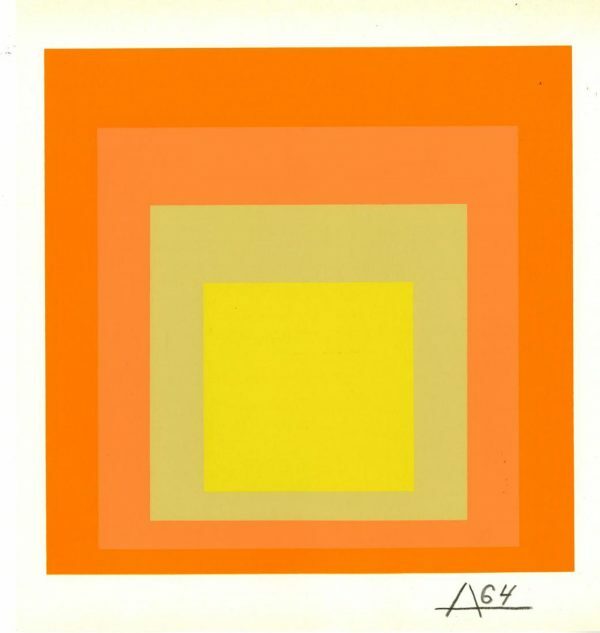 Also during this time, he created the abstract album covers of band leader Enoch Light’s Command LP records. 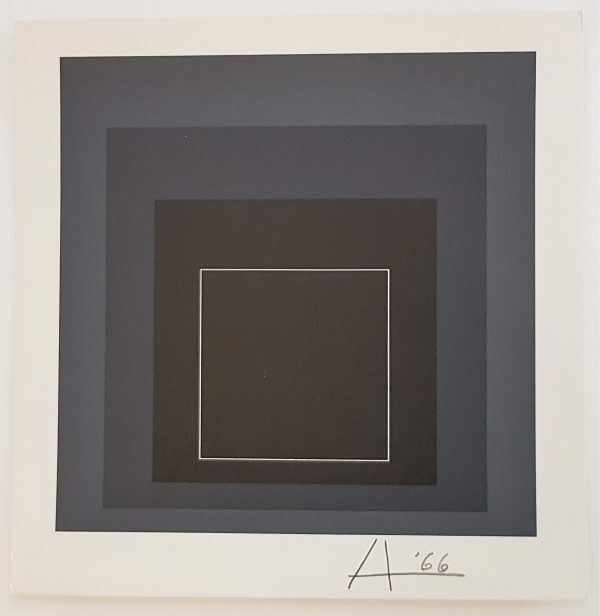 His album cover for Terry Snyder and the All Stars 1959 album, Persuasive Percussion, shows a tightly packed grid or lattice of small black disks from which a few wander up and out as if stray molecules of some light gas. 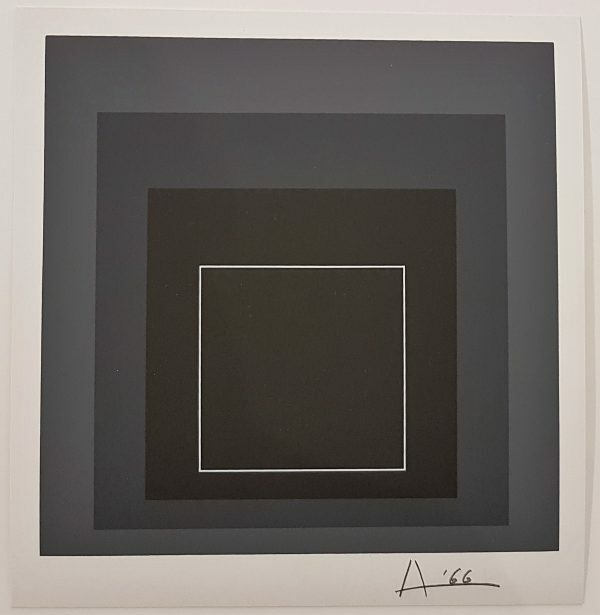 He was elected a Fellow of the American Academy of Arts and Sciences in 1973. 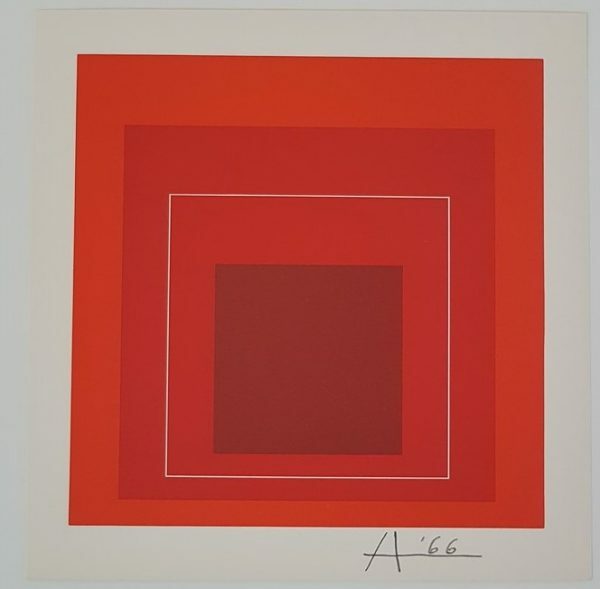 Albers continued to paint and write, staying in New Haven with his wife, textile artist, Anni Albers, until his death in 1976.